Buy 1 for $19.92Buy 2 / Save $1.06!Buy 3 / Save $3.99! Size (inches): 2.36" X 2.36" X 2.17"
Devil's Claw is most often used to help support joint pain and inflammation, but it can also be tried to help stimulate the appetite and for dyspepsia. As a blood cleanser it will remove deposits from the joints. It can also be used for reducing cholesterol, helping cleanse the lymph system, regulating blood sugar, stimulating appetite and aiding digestion. This herb contains iridoid glycosides, flavonoids, phenolic acids, harpagoquinine, oleanolic and ursolic acid derivatives, triterpenes and sugars. Balch, 1997; BHMA Scientific Committee, 1996; Hallowell, 1994; Hoffman, 1994; Tyler, 1993; Tyler, 1994; Wishard, 1995. 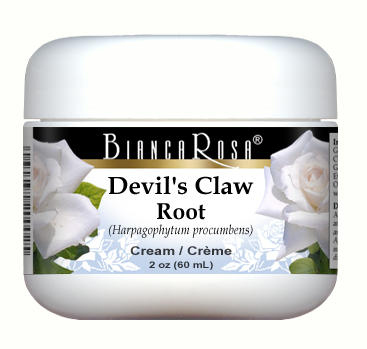 Apply Bianca Rosa cream morning and evenings, or as directed by a health care practitioner. On a moist cotton wool pad or with the fingertips, apply to the desired area of the body. Massage onto thoroughly cleansed skin with a gentle circular motion.